By default there is a diverse range of several hundred Google fonts which can be accessed straight away, we also provide the facility to upload your own Custom fonts. ...if you don't currently have a Style, choose 'New Style'. Choose 'Advanced options' and then select 'Typography'. 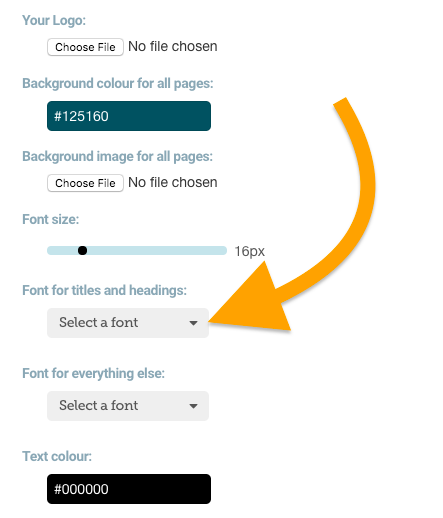 …here you will be able add your fonts, either by drag a file onto the area marked ‘Drop fonts here to upload’ or by pressing ‘Choose File’ to choose a file from your account. We accept the font types: .otf .eot .woff .svg .ttf, we recommend the format ttf. You only need to upload one of these files in order for the font to work across all browsers as Elucidat converts your font file to a Webfont which will be compatible across browsers. Please make sure that you have the license for the font that you upload. Here we have our favourite fonts, a selection of fonts that we have cherrypicked from Googles deep library of fonts. Next we have the choice to add Serif or San-Serif fonts, if you are not sure about which font type is most suitable for your Project. This option allows you to select from a variety of Handwritten fonts, great for when you wish add a personal touch to your Projects. These fonts allow are thicker and bolder, a good choice if you wish to make a statement but not recommended if you have a lot of copy in your Project.